This easy yet elegant vegetarian pizza combines cream-tossed onions, feta and mascarpone cheese on a simple naan bread crust. Cooked quickly on the grill, you've got fancy flavors in a flash. For other recipes using onions, please see my Onion Recipes Collection, part of the Visual Recipe Index by Ingredient. 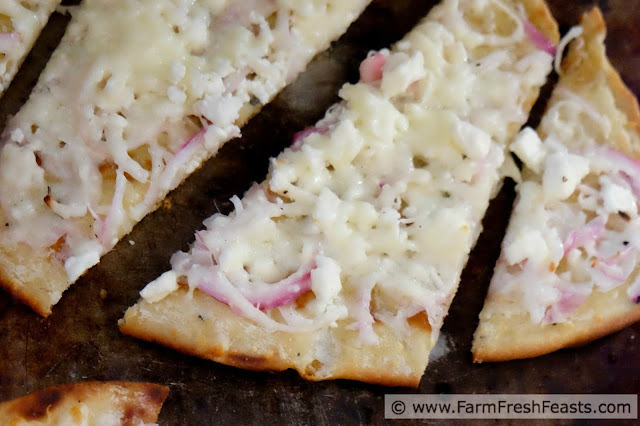 For other vegetarian pizzas, please see my Visual Pizza Recipe Index or my Friday Night Pizza Night Pinterest board. While I am always inspired by the contents of my Community Supported Agriculture (CSA) farm share box, the freezer, the fridge, and the pantry--sometimes I get additional inspiration for a recipe while I am in the shower. Sometimes I am inspired by my email inbox. Other times it is social media. When the Pizza Cipolla from Karen's Kitchen Stories came through my Facebook feed I was intrigued, and inspired. First, it caught my eye because it is a pizza, and I make pizza nearly every Friday night. [With a son in the high school marching band the 10-12 weeks of football season are a slight aberration.] Second, I happened to have 2 bags of onions lying around. It's August, I'm canning, and in a fit of 'what if I run out?' I sent said son to the grocery store for 'better make that 2 bags!' of red onions to supplement the pint in the farm share box. [Said son did not mind--he know he can buy a coffee with the change, and he's got plenty of room on his wheelchair for packages.] Third, I'd bought a bunch of heavy cream and mascarpone cheese to make this delightful Low Carb Mascarpone Mousse by Carolyn of All Day I Dream About Food. [It is delicious, even if you're NOT looking for a diabetic-friendly dessert for a luncheon honoring someone living with diabetes.] Since I had the right stuff for a good topping, I was all set. Except, as I mentioned, it's August. I'm canning tomatoes. [So far I've made crushed tomatoes, salsa, and pizza sauce. My plants are nearly dead--some weird brown leaf fungus this year--so I will end up bringing in the rest to ripen in the house and can later.] I had no desire to a) fuss with pizza dough or b) turn on the oven. Instead, I opened the freezer and fired up the grill. 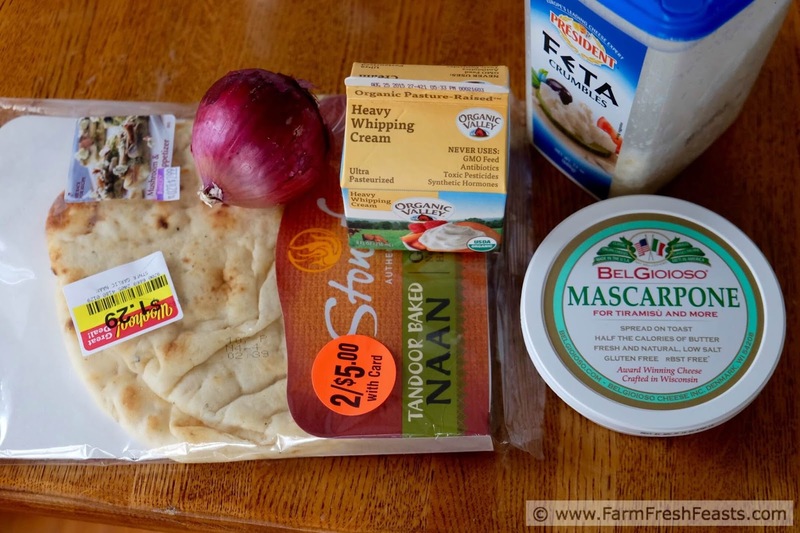 [Did you notice all the packages of naan in this photo of my freezer?] 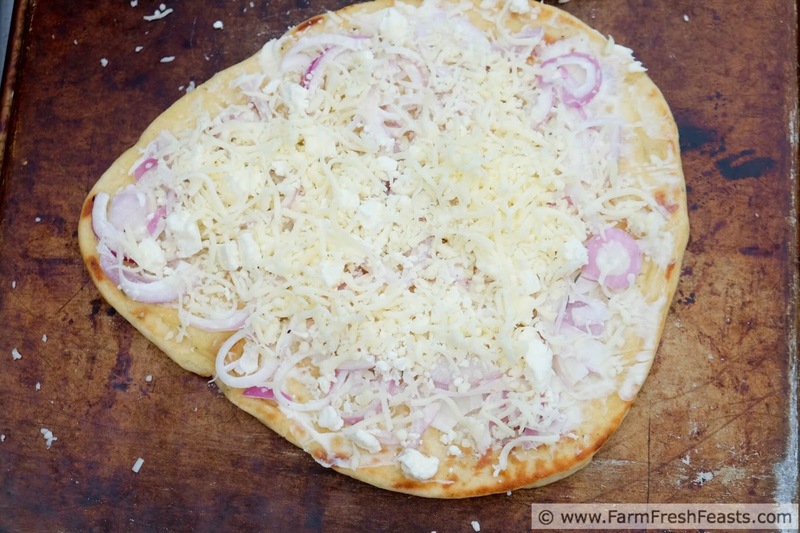 With an easy crust, I used Karen's pizza topping and added a bit more white stuff--mascarpone, feta, and shredded Italian blend cheese--to make a very easy, elegant, vegetarian pizza. One thing I probably should have done--grabbed some fresh thyme. I've got plenty in the garden but walking into my backyard these days is kind of a minefield. [Not the 'you've got 3 dogs minefield' or the 'we've marked the cleared path and don't recommend you step off the marked area, Lt' minefields, either.] It's more like the If You Give A Mouse A Cookie minefield. If I walk into the garden to get fresh thyme, I'm going to stop to check the progress of the volunteer squash vines taking over the patio. I'll notice a few baby zucchini and make a mental note to pick them later in the week. Then I'll see a bunch of peppers ready to be pickled and scoop up a handful. Even though my daughter harvested tomatoes the day before, there will be more to add to my arms. Walking back into the house to get a basket I'd trip over the now baseball bat-sized zucchini and smash my face into an impromptu salsa. I chose to use dried thyme to avoid that fate. Toss onions with cream and season with thyme, salt, and pepper. Set aside. Preheat the grill on full blast, scrape the grates with a grill brush, and turn down the grill to medium heat. My grill is new, very eager to please, and was still fired up to around 500 degrees Fahrenheit when I did the first batch of naan pizzas. I ended up turning mine down to low to get the thermometer to read around 400. 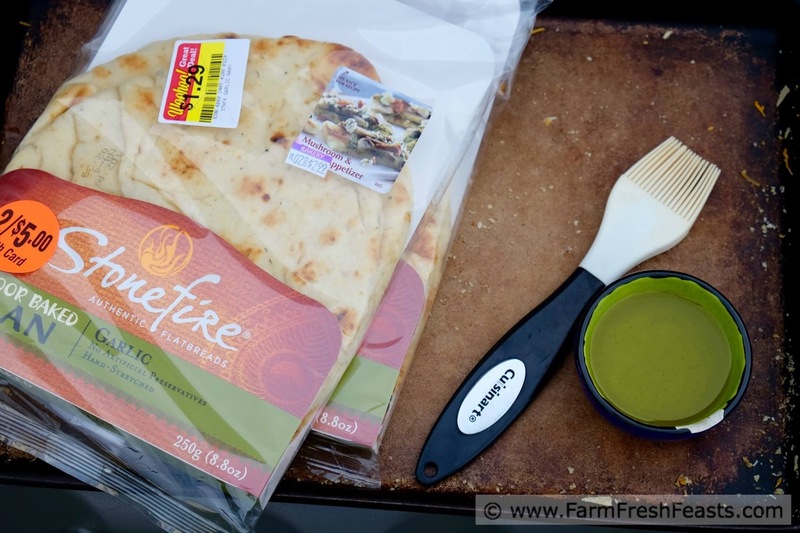 Brush the naan with olive oil and place on the grill for about a minute. I cover the grill while timing. Remove the pieces from the grill and brush the un-marked side with olive oil before turning it face down (grill marks up). 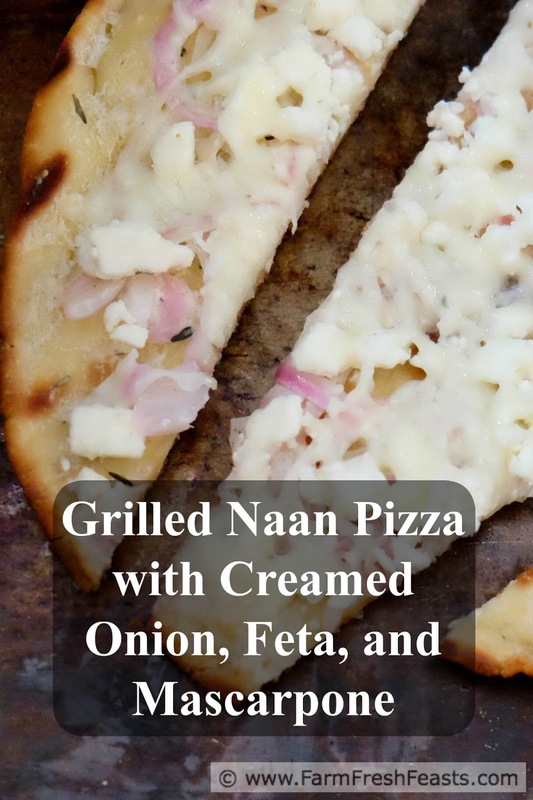 Spread the mascarpone cheese across the grilled side of the naan, then top with the creamed onions, feta, and Italian cheeses--dividing the toppings evenly between the two pieces. 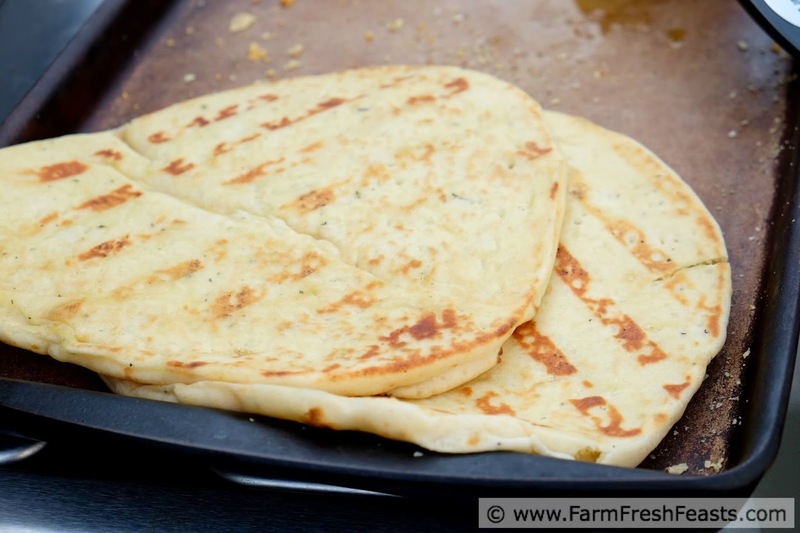 Return the naan to the grill, cover, and grill another 3 to 5 minutes until the cheese is melted and the onions are light brown on the tips. 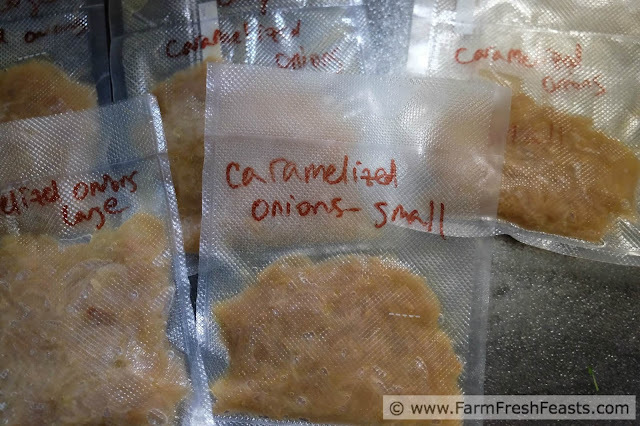 Thinly slice the whole bag of onions and use the rest in Dorothy's Slow Cooker Caramelized Onions. Wow, you're on fire this week with fantastic recipes. I've actually been pretty busy in the kitchen this weekend, with farmers market produce. The farm share produce we're eating our way through fairly easily now that the Hubby is home and unfortunately my garden is very sad. I've got some cherry tomato plants thriving and the rest is kind of meh. 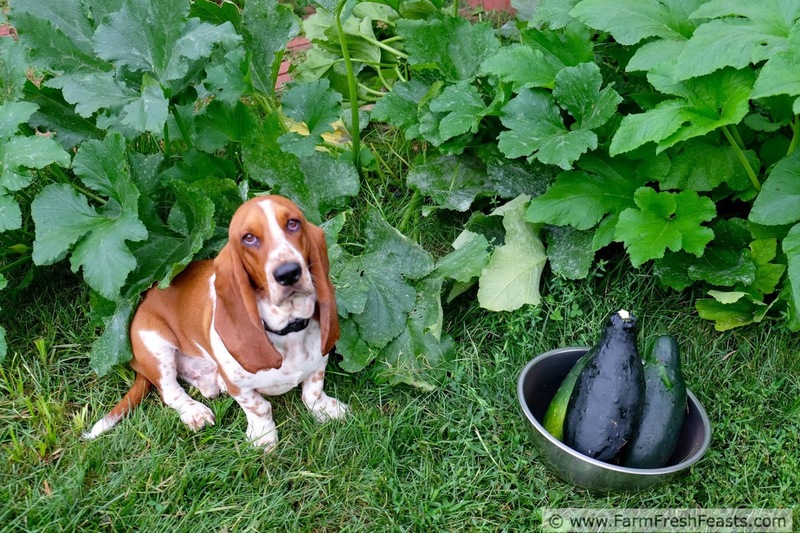 The zucchini never made it and something, other than me, keeps eating my cucumbers. Everything else is so-so. Not sad enough to rip it our, bit not really producing either. The herbs, on the other hand, are thriving. I can barely keep up and am thinking some herbed butter and salt needs to happen. I picked up the good salt from Penzey's too; the one you recommended. 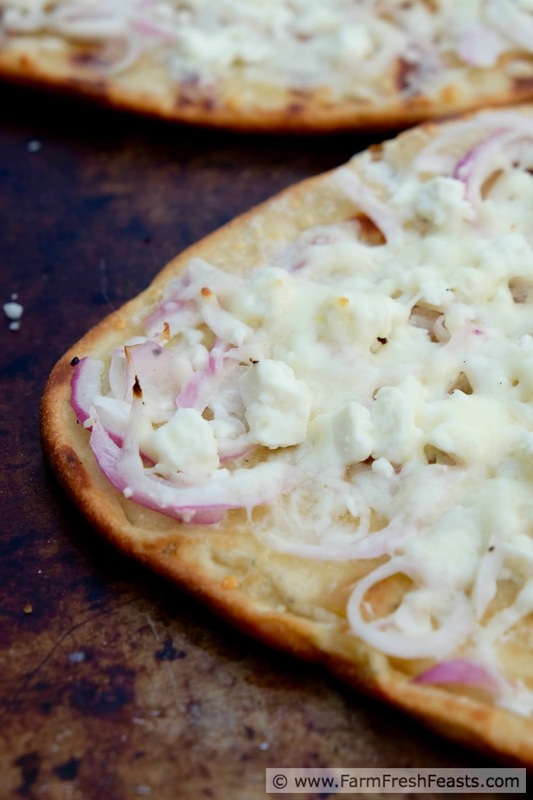 Anyway, the naan pizza sounds fabulous to me. I ripped. And I was glad. Until I saw someone else's green tomatoes. Then I missed my plants. Luckily, my neighbor shared some with me, so all ended well. Excellent job on the salt! Ooooooh. 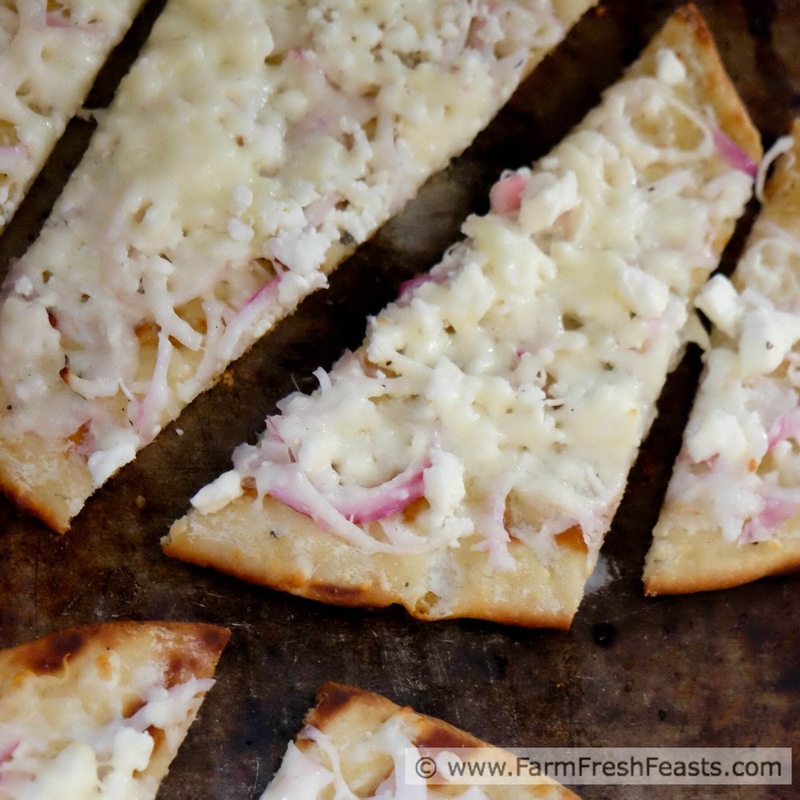 Naan pizza. I love you. Such a beautiful photo (of course!). Thanks so much for sharing. I'm not usually into making homemade pizza. I'm just too lazy to make the dough myself. But this one, wow, I simply have to make! Thanks! I'm not usually into making homemade pizza. I'm just too lazy to make the dough myself. But this one, wow, I simply have to make!